Though we have previously experienced many snowstorms and other types of storms, with the media and NWS predicting that this will be a historic mega storm like we've never seen before, we felt compelled to send out this bulletin with some very important safety items. 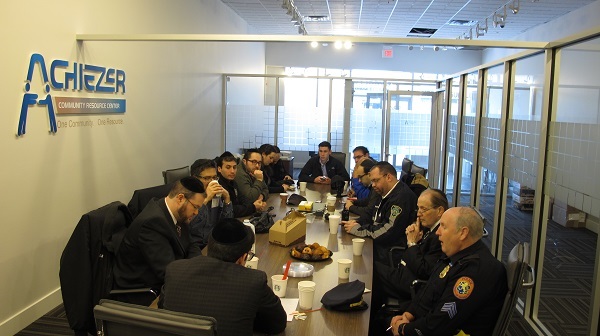 After meeting together this morning, this joint message is from: Hatzolah, JCCRP, Villages of Lawrence and Cedarhurst, NYPD, NCPD, RNSP, NYC Comptroller's Office, Phil Goldfeder's Office, Joe Addabo's Office, Todd Kaminsky's Office, Chaveirim and Achiezer. We will all be working together throughout the storm period to ensure streamlined emergency response and messaging. Here are some bullets from the meeting that everyone should PLEASE READ CAREFULLY. If you have an elderly, handicapped or vulnerable loved one or relative, the time to check up on them is NOW. Please ensure that they have enough food and a plan in place should they be stuck at home; or, in the eventuality that power is lost, they have cell phones, flash lights and other materials. In the event of a medical emergency, or even the possibility of a medical emergency, HATZOLAH and/or 911 should always be called first. In the event of a non-emergency, yet medically necessary need, such as dialysis, medical treatments, etc. Achiezer can be called to deal with such situations. In the event of a prolonged power outage, we have prepared plans for shelters and community centers which will be opened as needed throughout Far Rockaway/Bayswater, as well as the Five Towns. In the event that you plan on using an old generator that has not been properly serviced, please speak with a professional or follow manual instructions to avoid any dangerous results. If and when you will be sitting in your car, please make sure to clear any snow from the exhaust pipe. It can cause carbon monoxide poisoning. In the event that a particular type of help is needed, please note the following phone numbers. Hatzolah 718-230-1000 - Medical and life threatening emergencies. Achiezer 516-791-4444 - Non-emergent Medical and pressing needs. Chaverim 718-337-1800 - Roadside assistance. JCCRP 718-327-7755 - Emergency food assistance, will be accessible via staff at YIWB and the White Shul. RNSP 917-727-7306 - Safety Patrol. Assemblyman Goldfeder's Office 718-945-9550 - NYC. If you are unsure what type of help is needed, or have any uncertainty, you may call 516-791-4444 24 hours a day. Finally, and most importantly, please stay safe. From 6 PM tonight we urge that nobody drive out on the streets unnecessarily. It will be dangerous and will make it difficult for emergency vehicles to pass. Additionally, if you are able to, please park your vehicles in driveways so streets can be properly cleared.